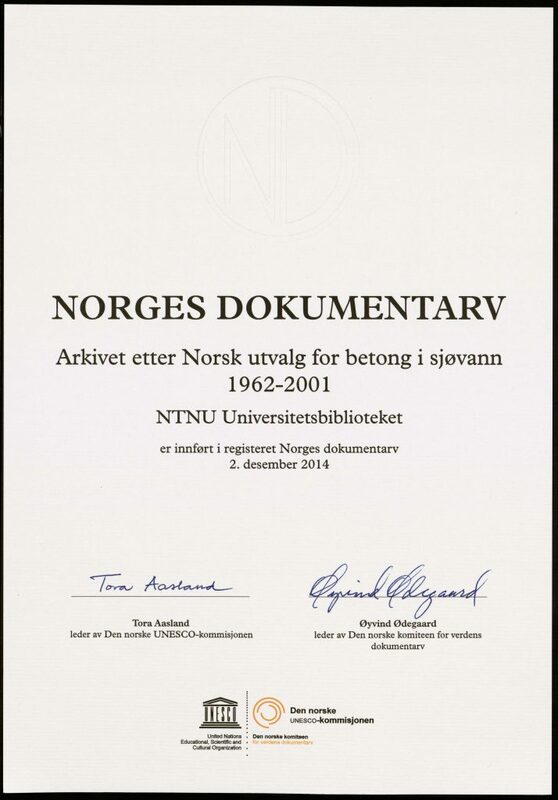 The NUFBIS Research File at the NTNU University Library, Trondheim, Norway, was in 2014 included in the “Norwegian Document Heritage“, which is the Norwegian part of UNESCOs “Memory of the World”. 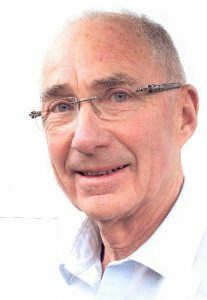 The ground for this inclusion was: “The results from the extensive field investigations of marine concrete structures along the Norwegian coastline were crucial for use of concrete in offshore structures. This is the history of the 1960s project where the condition of more than 200 marine concrete structures along the entire Norwegian coast was investigated during the years 1962 to 1968. The marine concrete structures were examined over and underwater, samples were taken and photographed. All this documentation is now stored in the archive “Norwegian Concrete for Concrete in Sea Water”. 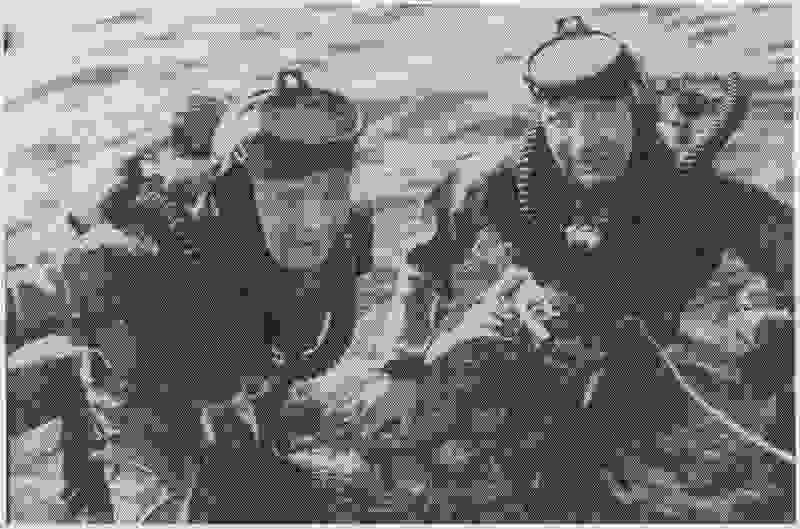 Project manager Odd E. Gjørv and colleague dressed in diving equipment. The extensive surveys of concrete wharves along the Norwegian coast also included surveys of the quays from the underside. This meant that diving equipment had to be put into service. (see page 18 of the book: “Durability Design of Concrete Structures in Severe Environments, Second Edition 2014). The project led to a final report written in English. This was crucial for the results of the project being read and understood abroad. 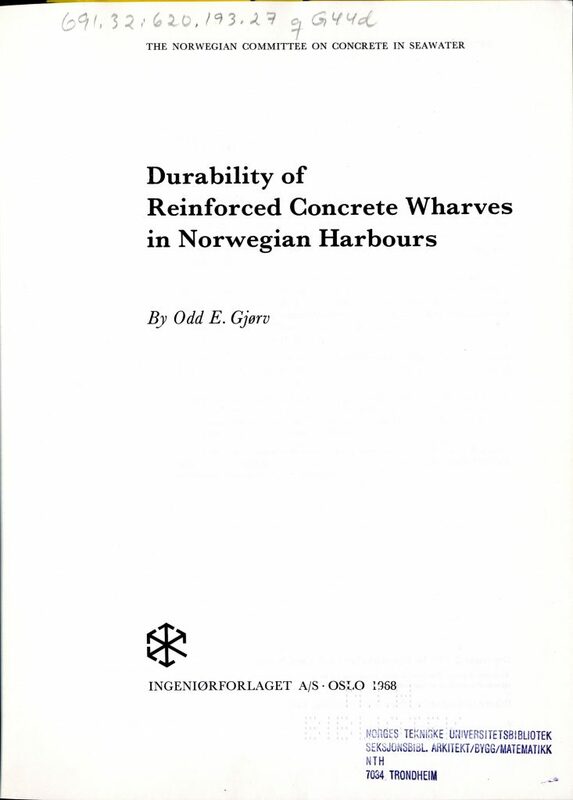 The front page of the report (“Durability of Reinforced Concrete Wharves in Norwegian Harbors”) published in English in 1968, which was so important in the choice of concrete offshore, and so for Norway’s oil age. The conclusions of the project led to a decision to use concrete as building materials nationally and internationally in offshore oil platforms. The conclusions and recommendations of the Norwegian field studies also helped to form the technical basis for the new international regulations for offshore concrete structures in 1973, which was later adopted by the Norwegian Petroleum Directorate and Det Norske Veritas in 1973. The first concrete platform (“Ekofisk”) on the NCS was completed in 1973. This was a pioneer work which led to a consortium of Norwegian companies immediately afterwards receiving the first order on a “Condeep” from Mobil. Later, 27 concrete platforms have been built, all of which have contributed to the technical and economic recovery of gas and oil on the Norwegian continental shelf. According to the Norwegian Oil Museum, this was the largest export contract for Norwegian companies. 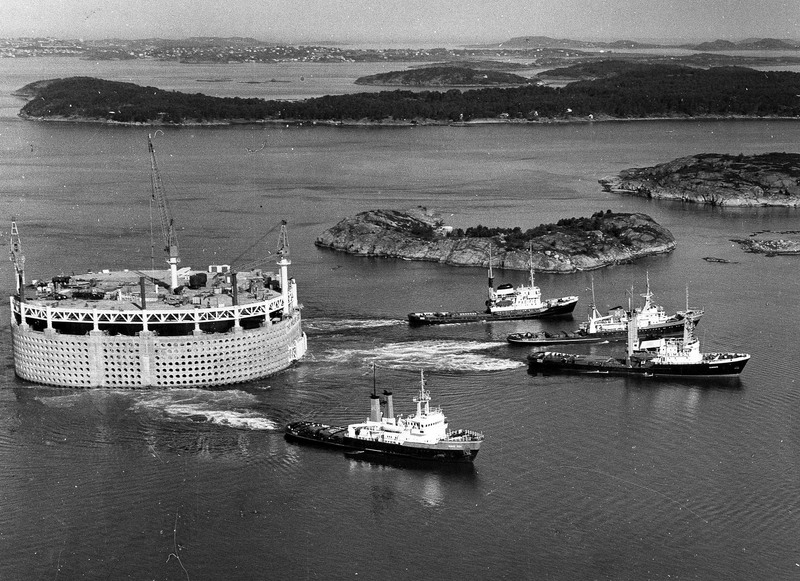 Foto: The “Ekofisktank” ,the first offshore concrete platform on its way from Stavanger in 1973. This represented a turning point in the use of concrete offshore under rough conditions. Experience from the use of concrete in exposed environments has later also contributed to giving Norway a special position in terms of expertise in the use of concrete in exposed environments. The Norwegian Unesco Commission for Admission to Norway’s Document Heritage assumes that this archive has high societal relevance as a technical-scientific research archive is a unique source for studying the early Norwegian offshore and concrete industry, and with the start of the Norwegian oil adventure. Furthermore, it is an important contribution when Norwegian oil history is to be written. Gjørv, Odd E.: “Durability of Reinforced Concrete Wharves in Norwegian Harbours (1968) Ingeniørforlaget A/S Oslo 1968.